The left's response to Israeli atrocities in Gaza provides a case study in ressentiment. If we want to stop such slaughters rather than participate in the spectacle of them, we need to stop fetishising distant victims and start trying to exercise power over our own lives so that meaningful solidarity becomes possible. A tentative peace reigns in Gaza, if you can call a devastated open prison, surrounded by one of the most powerful militaries in the world, where "Hamas fighters stride confidently down the road with rifles slung across their shoulders" as at peace. 'Both sides' claim victory, while the overwhelmingly proletarian population counts the cost. This underlines precisely the problem in seeing the 'sides' of this conflict in national rather than class terms; when the bourgeoisie make war, proles always lose. $1bn dollars of Saudi reconstruction money will soon line the pocket of the region's construction bosses; as anyone who followed the Halliburton/KBR scandals in Iraq knows, reconstruction is a lucrative business. So another slaughter has come and gone as we stood by as spectators, and again overwhelmingly the opposition to the conflict was framed in national, not class terms. Of course even the most perfectly phrased communist slogans would not have made a material impact on the slaughter, but while nationalism offers nothing but endless bloodshed for the nation, a practice of seeking out, supporting and trying to generalise the small seeds of hope in the region - the village committees resisting the wall in the West Bank, Israeli refuseniks, protestors, Sderot residents and anarchists, the class struggles in Egypt and the fact many more Gazans elected to flee the bombardment than martyr themselves for the nation - at least offers the potential of a different future. anti-consumerism (Buying stuff bad! Dumpster diving good! ), anti-imperialism (Imperialism bad! Resistance good! ), Class War Federation (Toffs bad! Workin’ clarse caricatures good! ), black pride (White good? Black good! ), gay pride (Straight good? Queer good! ), much anarcha-feminist health (Patriarchal medicine bad! DIY herbalism good! ), and even heavyweight theorists like Toni Negri, Harry Cleaver and other ‘Automonist Marxists’ who have a tendency to pose the working class as an autonomous force external to and in conflict with capital which must affirm itself (Capitalist valorisation bad! Self-valorisation good!)" To suggest that being anti-war might mean opposing both the capitalist factions engaged in it might not be that controversial to ordinary people, but is met with hysterics from leftists. As a result, there has been much in the anti-war movement that is troubling. Of what did these hysterics consist? The first part of our case study is the reaction on UK Indymedia to the AF's text 'No State Solution for Gaza.' While criticism was not universal and the statement enjoyed some support, the leftist reaction was twofold. First, it was claimed that the idea anyone on the left or the demonstrations supports Hamas was a "straw man" and "a blatant lie" (more on this in a minute). Secondly it was alleged it "plays into the hands of Zionists" and the AF and other internationalists are "apologists for the Israeli genocide" - remember this is a text that opens with the sentence "one thing is absolutely clear about the current situation in Gaza: the Israeli state is committing atrocities which must end immediately" - some apologetics for Zionism! The criticism was accompanied by vague threats of violence ("the next member of AF I meet is going to suffer the consequences"). Leftists routinely equate Zionism with Nazism. 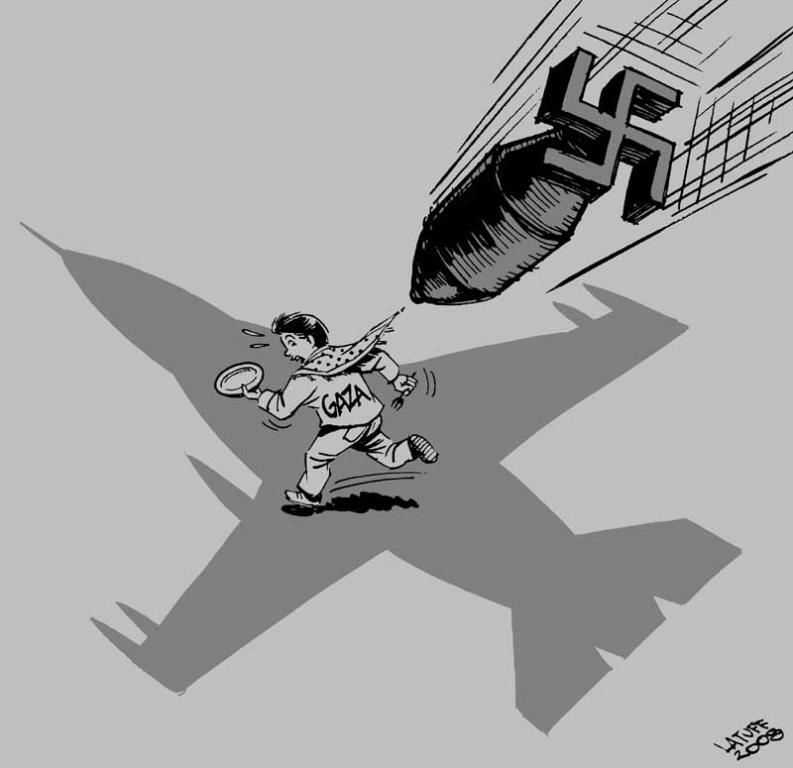 Latuff's cartoon illustrating this blog is one of many examples from him, while the term 'zionazi' is a staple of IMC-UK comments.2 The manifestation of this in relation to Gaza has been the comparison of the assault to the liquidation of the Warsaw Ghetto by the Nazis and the widespread labelling of the Israeli assault as a 'Holocaust.' This exagerated claim wasn't plucked from thin air, it stems from the widely reported misquoting of Israel's deputy defence minister. He used the hebrew word 'shoah', meaning catastrophe, not 'hashoah', meaning the catastrophe, the holocaust. But one has to ask where the usual leftist skepticism towards the capitalist media goes when encountering information that affirms ones biases. However what is worst about the Israeli onslaught is that - and in this respect only it is like fascism - it is in fact nothing uniquely bad in the world of capitalist barbarism. The blockade, the media blackout, the use of white phosphorus in densely populated civilian areas were all features of the US destruction of Fallujah in 2004. More widely, far from being an exceptional 'genocide', Israel has acted largely within the norms of Western barba- civilisation (if one takes the US/UK as standard-bearers for this civilisation and Iraq as their standard). Ignoring this however, leftists set up Zionism as the ultimate evil; one banner on a march even described it as "1000 times worse" than Nazism. Consequently in the face of such an evil, all principles become 'ivory tower' pontification, all critical thought must be postponed. Thus we're told that "Hamas are nasty morons but today they are illuminated saints compared to the Israelis" - ressentiment par exellence; opposition to evil is beyond criticism. We are told that to criticise Hamas is to say "that the Republican government in Spain was equally as bad as Francos fascists." This example inadvertantly gives the game away (we will return to the fallacy that mutual criticism means equating the things criticised in a moment). It was of course the Republic that butchered the revolutionary working class long before the fascist victory (before the fascist putsch in fact, at Casas Viejas). This is precisely the leftist 'my enemy's enemy is my friend' logic Dauvé attacks in 'Fascism/anti-fascism', a logic of a united front that leads to all kinds of suicidal alliances with class enemies - and as the example of Spain illustrates the physical suppression of dissent. The next episode in our case study was therefore aptly timed. After much foot-stamping histrionics and insistence that saying support for Hamas existed on the demonstrations was a "blatant lie" (despite visible Hamas flags, and leftists praising their "brave resistance" etc), a controversial incident was captured on camera. The incident involved the destruction of a placard held by an AWL member by the chairman of Sheffield Palestine Solidarity Campaign, applauded by members of the SWP. The placard read 'no to IDF / no to Hamas' on one side and 'solidarity with women, workers & the left' on the other. The post hoc justifications for this were two-fold (ignoring the undercurrent of Trot sectarianism which doesn't change the arguments made). Firstly, the slogan 'no to IDF / no to Hamas' was claimed to equate the IDF and Hamas. There was no equals sign, and you needent have schooling in formal logic to realise that rejecting two things doesn't necessarily imply equivalence. A string of posters produced a list of body counts to 'prove' the inequivalence of the IDF and Hamas. A quantitative inequivalence for sure, nobody disputes it, but what crude morality judges the rights and wrongs of a group solely on their body count? If an equivalence is implied, it is a qualitative one, akin to 'No to the BNP, No to Labour' - which doesn't imply the BNP are kicking down the doors of, incarcerating and deporting immigrants on anywhere near the scale of the governing party, merely that they're both bourgeois forces and as communists we reject both. In fact Brighton Solfed recently distributed a leaflet saying just that, and nobody went hysterical about 'equivalence' - although you can imagine Labour apologists doing similar mental gymnastics to their Hamas counterparts. For good measure, the placard was also described as "insensitive" (might hurt Hamas' feelings?) and "Zionist" ('no to the IDF' ffs!) while the AF were apparently "cheering on Zionists who disrupt Palestinian solidarity rallies" for objecting to the theft and destruction of the placard. This lead onto a second criticism about who has the 'right' to a (critical) opinion on Gaza. Apparently "it takes the piss to slag off the very people who are being bombed" - even if they're Islamist gangsters. Victimhood gives one a special place in the leftist worldview. For criticising Hamas, I was told "who are you to tell them how and when they should rise up and whether they are doing it properly?" echoing an earlier theme that "if the Palestinians want a state, and are dying for that right, it is only decent for you to keep your puerile little political fantasies buttoned." And "the fact I would prefer to live without a state does not qualify me to lecture Palestinians on what they should be aiming for." The assumption is that anyone who isn't under the bombs cannot have a valid opinion (of course one can speak for 'the Palestinians' so long as one is uncritical). An affirmation of victimhood as the prerequisite of subjectivity.3 The fetishisation of 'the resistance', romanticised fighters with AK-47s is precisely "born of weakness" (Nietzsche, see below) - powerless in our own lives it is easy to project our absent agency onto an Other who is put beyond criticism ("who are we to criticise Palestinians?"). Ressentiment oncemore. Consequently, the leftist support for the destruction of the placard - in some cases from the very same people who said saying there was support for Hamas on the demos was "a blatant lie" - could be summed up roughly as follows. 'I don't support Hamas, but...' - 'I do support the physical suppression of criticising them' and 'I would say anybody that stands if the face of Israel deserves my support.' Supporting while not supporting is a curious act of leftist doublethink. Presumably anyone destroying an (for the sake of argument uncontroversial, not anti-semitic) anti-Israel placard would immediately be identified as a 'supporter of Israel' or rather a Zionist. But apparently physically destroying a placard critical of the IDF, Hamas and calling for solidarity with women, workers and the left, on account of the critical mention of Hamas, is not support. The mind boggles. What is good? All that heightens the feeling of power in man, the will to power, power itself. What is bad? All that is born of weakness. So what would activity not rooted in ressentiment look like? The most obvious answer - and a popular one amongst the critics quoted in this blog - is direct action activism. On the face of it, this breaks out of the passive marches, the spectacle of dissent, and materially disrupts the war machine. To a certain extent this is true - by all accounts the recent smashing of EDO by Smash EDO (pictured right) did cause significant damage to precision tooling that will disrupt production of the electro-mechanical components for bomb release mechanisms they manufacture. But there are valid questions to be asked about the effectiveness of such acts (in over 4 years of 'actions', there's not been any demonstrable impact on the war effort), and their exclusiveness, that is the fact they necessarily exclude those who for one reason or another (kids, jobs...) can't risk arrest or lengthly legal procedings. The key to understanding both the role of the militant and the activist is self-sacrifice - the sacrifice of the self to 'the cause' which is seen as being separate from the self (...) Revolutionary martyrdom goes together with the identification of some cause separate from one's own life - an action against capitalism which identifies capitalism as 'out there' is fundamentally mistaken - the real power of capital is right here in our everyday lives - we re-create its power every day because capital is not a thing but a social relation between people (and hence classes) mediated by things. Consequently, while activism certainly has the 'feeling of power' Nietzsche praises, that power is almost entirely just that, a feeling, experienced on an individual or ghetto level, and so it's ulitmately 'born of weakness. '4 Real power is something collective, something social, something exercised in everyday life. This means on some level it has to be an expression of class power, since capital is a class relation of which war is a symptom, not a single issue which can be addressed palliatively. Very early on Smash EDO opted for the latter route, abandoning attempts to fraternise with workers at the first hurdle, perhaps with a Lucas Aerospace approach in mind, and opting more for substitutionist SHAC tactics. A recent example from Greece, although the circumstances are unclear, seems to reflect a more collective apporach, with a call to blockade a port due to ship arms to Israel taken up by multiple groups, which against the background of the recent social insurrection apparently caused the shipment to be cancelled. But not being in a position of open insurrection, or even heightened class conflict and solidarity, how does the Greek example relate to us here in the UK? The 2003 refusal of two anti-war train drivers to move weapons bound for Iraq provides a glimpse at the impact class power could have on the mobilisation for war. And of course class power does not just mean industrial action (important though it is), as the widespread use of blockades during the anti-CPE struggles in France (or the Piqueteros in Argentina for that matter) showed. So the question becomes how do we get from A to B, how do we increase class power? That's a difficult but necessary question.5 However, it's clear that humanitarian sympathy does not require a fetishisation of victimhood, that a desire to act does not have to mean a subsitutionist urge to 'do something' and that an opposition to war cannot mean (however temporarily or critically) supporting any side other than the working class. Class power is beyond good and evil, it requires the assertion or our own needs in our everyday lives which puts us in a position to engage in meaningful solidarity with our fellow proletarians around the world. 1. Astute readers may suspect my own insistence on defining communist politics in opposition to leftist ones is in itself an example of ressentiment. I would disagree, my opposition to leftism is not because I see it as evil, but because it contradicts the things I do stand for - internationalism, working class solidarity and ultimately self-abolition, stateless communism and so on. If leftism disappeared tomorrow my communism would remain, since its values exist independently of the existence of leftists who are merely a convenient foil to help express them. 2. A particularly nasty and overtly anti-semitic example can be found here - "The Jews are the new Nazis and must be treated as such (...) Generations of inbreeding have wrung the last drop of humanity out of their genetic makeup (...) Governments will not take on the Jews. It has to be ordinary decent people around the world." 3. This fetishising of victimhood is also apparent in many of the responses to a cop's post on Indymedia; e.g. "did the masked police officers have to go through the same ordeal? Of course not and they would have objected violently if anyone suggested that they should. And they think that people should treat them with respect." Respect comes from suffering. Jesus. 4. Such individual 'feelings of power' can't be dismissed entirely, as they can have a transformative effect on the people involved. Aufheben's A phenomenal anti-war movement? discusses this process of politicisation in relation to the mass direct actions in Brighton out of which Smash EDO was to form. From a point of view of ressentiment, the question is then where such politicisation leads in the absence of mass, collective struggles. 5. I know the AF are currently redrafting their strategy, while Brighton Solfed are drafting a pamphlet on strategy and organisation, which should hopefully contribute to this necessary debate. The politics of affirmation... or the politics of negation? haha, could be read that way. a love of military force projection and imperialism perhaps. The BBC's Christian Fraser, in Rafah on the Gaza-Egypt border, says many of the 40,000 people who fled the town during the conflict, were returning to pick through the ruins of their homes on Sunday. HAMAS probably has several hundred members in its armed wing, the al-Qassam Brigades, along with its reported 6,000-man Executive Force and tens of thousands of supporters and sympathizers. $1bn dollars of Saudi reconstruction money will soon line the pocket of the region's construction bosses; as anyone who followed the Halliburton/KBR scandals in Iraq knows, reconstruction is a lucrative business. I stopped reading this article here because you clearly do not understand the situation in Gaza if you think any sort of reconstruction will take place. Israel does not allow construction materials into Gaza. The most that gets done following a bombing in Gaza is that the rubble gets cleared away, there is never any reconstruction. Even the UN school didn't get rebuilt. This article was written almost two years ago. I imagine the writers simply hadn't predicted that Israel would simply bar construction. This does beg the question of how what actually happened fits in with the article's analysis. It seems that what is actually happening is that the Israeli bourgeoisie are very happy with Gaza remaining a steady, hostage market to some of their products, while any kind of reconstruction which might lead to a resurgence of local industry would run afoul of that, and they no longer have the direct anti-industry enforcement powers like they do in the West Bank.